ProKNX has released realKNX Air, a next-generation voice control solution for home automation. In addition to the well-known voice assistants Siri, Alexa and Google Home, realKNX Air also offers extremely powerful, offline voice control that runs directly on-device, without cloud services, and without the need for an Internet connection. This means that privacy is guaranteed; what you say at home stays at home. Another advantage is that the installation stays independent of cloud service updates and Internet accounts. 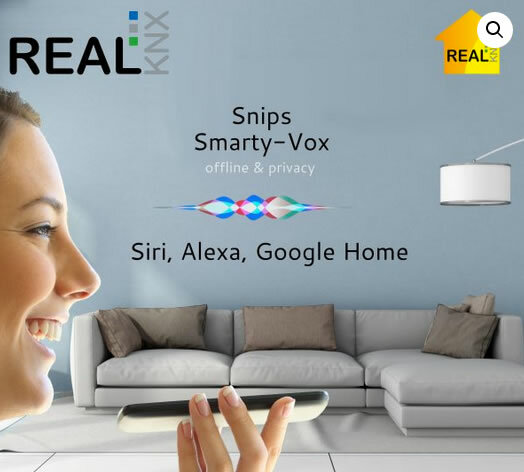 realKNX Air, the latest product from French start-up company ProKNX, was developed in partnership with the French company Snips.ai, the specialist in decentralised voice assistant technology. To control a KNX device, the user simply says ‘Hey Snips, turn on the lights’ or ‘Hey Snips, set the thermostat to 22 degrees.’ The processing of the voice command happens on the user’s realKNX server and no data is sent outside the building. The first release of realKNX Air speaks three languages: English, French and German. The voice commands and possibilities of the commands and questions can also be adapted by ProKNX according to any special requests. realKNX Air comes with the realKNX industrial PC server and the proServ KNX/Ethernet gateway. The proServ can be programmed with an ETS standard product database. All that is required to operate it is the connection of a speaker microphone and connection of the realKNX server. It is then ready for use. The realKNX Air solution is based on the KNX worldwide building control standard. The KNX standard guarantees that all certified products will work together. There are more than 400 manufacturers in 42 countries that comply with the KNX standard, and there are more than 71,000 professional KNX installers in 161 countries. Conditions: valid when you order realKNX Air in our webshop November 2019. Use the coupon code knxtoday100eur.